There are several ways of making roofing felt on the roof Garden shed to bring the tool shed or the garage. In addition to nailing and welding, it is also possible to glue the bituminous sheets. Here, the do-it-yourselfer even has three different options. Those who decide against nail and hammer often choose the adhesive variant. It has the advantage that the surface on the roof is mostly waterproof. Both rainwater and standing water will not seep through the roofing felt if properly processed. However, DIY enthusiasts are still spoiled for choice because there are several ways to glue them together. On the one hand, roofing felt can be applied to the roof with so-called cold glue. 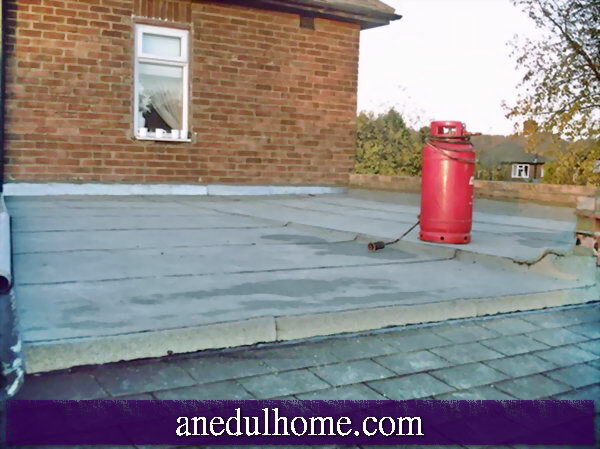 But even with loose or already applied on the web bitumen adhesive, which is to be heated, the roofing felt can be attached. And as a third variant, the trade also holds self-adhesive roofing felt. Behind it hide bitumen membranes, which already have adhesive surface. Regardless of which version is chosen, the material list is in most cases the same. If you want to continue using the tool after gluing, you should quickly clean it with solvent after finishing the work. Otherwise it will usually be unusable. In all three variants, the handyman always starts the same: The roof must be prepared. It is important to measure the correct roof area in order to calculate the necessary material. Once all materials have been purchased, the roof needs thorough cleaning. Here, all parts should be removed, which can damage the roofing felt. Every crack means the destruction of tightness. Therefore, especially splinters and bumps should be removed. The roof must be swept clean and dry before installation. Also, the area should be free of grease. Is moisture absorbed in the substructure? This must also be checked prior to installation and if necessary eliminated. I can also prepare roofing felt myself. As it is usually supplied on rolls, it is helpful to roll them out and leave them a few days before gluing. Then it works better. Who decides on the cold glue starts with the primer. This is best applied with the scrubber. The primer serves to strengthen the adhesion of the cold adhesive. Is the roof made of a wooden structure? Then no primer is necessary, the first layer of bitumen is applied with nails before the next layer of adhesive follows. Then the actual gluing is off. The cold adhesive is poured onto the substrate and spread with a scrubber or puff in the width of a Dachpappenbahn. The instruction of the glue tells how long it has to dry before the bituminous sheet can be rolled onto it. Attention: Air bubbles should not be produced. Then the roofing felt is pressed and weighted with aids if necessary. The next track should overlap about five centimeters to ensure tightness. If the entire roofing felt is glued, it is advisable to repair all connections with the spatula and cold glue again. Then it's time to let it dry. This can take a few days. For this variant, the do-it-yourselfer has to plan around one liter of cold glue for one square meter of roof area. Safety when working on the roof is the be-all and end. Working shoes and helmets are just as obligatory as mouth guards and gloves. In some cases, ropes are also recommended when working on the roof. Children should be kept away from the construction site. Sticking with hot glue is similar. Here, however, the glue is previously heated. This can be loose, but also be mounted on the roof felt web. In the latter case, the process is referred to rather than welding, called the roofing felt itself welding track. When using loose hot melt adhesive is this first heated until it is viscous. Then it is like the lime liver with tassel, brush or scrubber elapsed. However, it is painted here after laying on the roofing felt. The handyman should pay particular attention to the edges. This variant is only suitable for experienced craftsmen, because the roof can quickly become leaky due to improper use or even cause injuries due to the hot-melt adhesive. The external conditions also play a role in the bonding of roofing felt. The temperature should not be below ten degrees Celsius. Dry weather is equally important. In this variant, adhesive surfaces are already present on the individual webs, similar to self-adhesive film. The surfaces are protected with a foil, which has to be removed when laying. The web should therefore be rolled out and the film then removed piece by piece. Attention: The tracks should overlap. Behind it follows a firm pressing, the home improvement works best with a brush. Particular attention must be paid to cracks, kinks and air bubbles that damage the seal. With the self-adhesive variant, it is advisable to work with nails or staples to increase durability. If you want to tie bituminous membranes to your roof, you can resort to three different bonding methods. However, the variant of the hot melt adhesive is only suitable for experienced DIY enthusiasts, while the self-adhesive roofing felt can be laid by anyone. But here the tightness is not always as pronounced as with cold glue. All methods should always be safety-conscious. The clever DIY enthusiast also keeps an eye on the preparations and the surrounding conditions.